This Sweet Potato Casserole recipe is vegan, gluten-free, and made without refined sugar! My favorite part of Thanksgiving dinner is the sweet potato casserole. My husband is cringing right now because he passes it up all together. What can I say? Sweet potatoes are one of my favorite foods and that doesn’t change on Thanksgiving Day. But the question is: Does the Internet need another sweet potato casserole recipe? Surely there are plenty out there, why clog up the interwebs with another? Well, it turns out there aren’t quite as many recipes out there that don’t include a truckload of sugar, butter, and the dreaded marshmallow top. I’ll save my marshmallows for dessert, thankyouverymuch. The sugar is another story. Whenever we have Thanksgiving with my brother, we get treated to my sister-in-law’s mother’s delicious cooking. Her sweet potato casserole, which has no marshmallows, by the way, is heavenly. When I asked for the recipe, I was astounded to see it had 1 cup of sugar added to the spuds. 1 cup! Plus more in the brown sugar and butter streusel topping. Yikes. It turns out that it is totally possible to have a flavorful and healthy sweet potato casserole. The sweet potatoes are sweetened with just a touch of maple syrup. It’s all you need, really. Sweet potatoes are naturally sweet! Coconut milk adds a creamy texture that is out of this world. The coconut flavor is mild and compliments the sweet potatoes well, but you can totally use cow’s milk if coconut milk isn’t your thing. A few spices balance out the flavors and some orange juice and a little orange zest add an unexpected punch. I list the zest as optional–if you want a more subtle orange flavor leave it out. The other thing I do differently to prepare this healthy sweet potato casserole is bake the sweet potatoes instead of boiling them. It takes a little longer to cook them this way, but it also eliminates the need to peel and cut them up. There are two reasons I prefer baking them in the oven to boiling them. First, when you boil vegetables, some of the nutrients leak out into the water and then you pour them down the drain. With baking, the nutrients stay in the potato. Second, you also lose flavor when you boil vegetables. Baking these only intensifies the flavor. 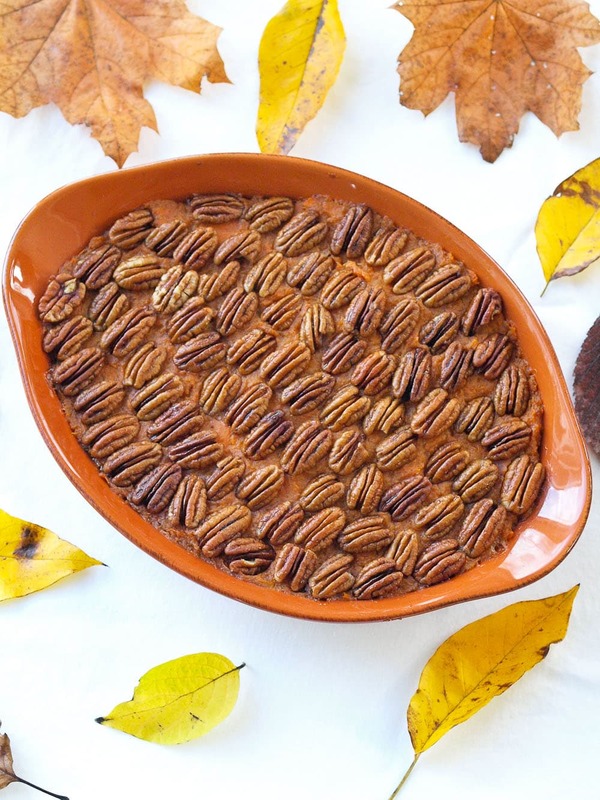 I love the pecan topping on this casserole. I left them whole because I think it makes a beautiful presentation. You can also chop them if you prefer. I hope that you’ll add this Sweet Potato Casserole recipe to your Thanksgiving Day favorites. It’s a gluten-free and vegan recipe that everyone will love! Made without refined sugar and a touch of orange flavor, you’re going to LOVE this healthier Sweet Potato Casserole recipe! Preheat your oven to 400 degrees. Pierce the sweet potatoes with a fork and place them on a rimmed baking sheet. Bake them in the oven until they are very soft, 60-90 minutes, depending on their size. Turn the potatoes over once during the baking time. When the sweet potatoes are finished cooking, allow them to cool. Once they are cool, use a knife to cut open the skin and peel it out. Discard. Put the sweet potato flesh into a large bowl and mash well. Add the next 8 ingredients (through orange zest, if using) and mix well. Place the sweet potato mixture in a 2-quart baking dish. In a small bowl, mix together the pecans, coconut oil, maple syrup, and cinnamon. 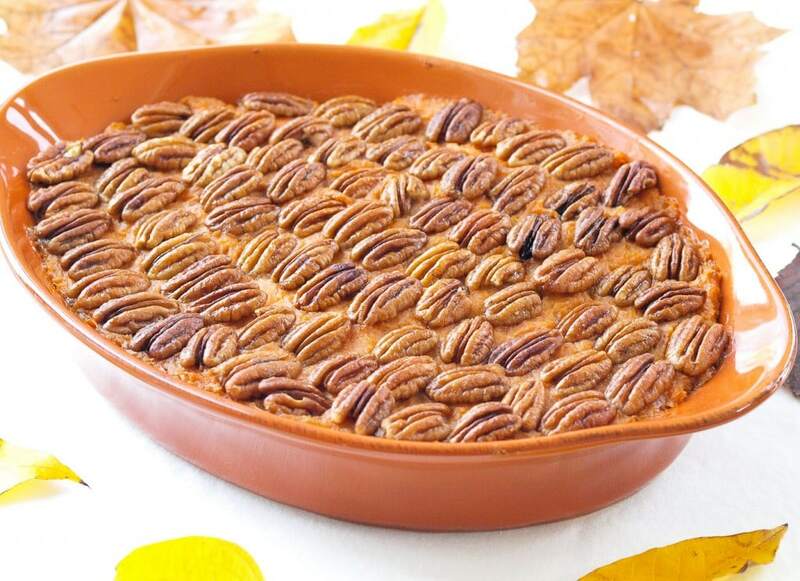 Place the pecans on top of the casserole as shown in the pictures. Reduce the oven temperature to 350 degrees and bake for 20-25 minutes, until the top is lightly browned. Enjoy! You also should try my vegetarian (easily made vegan if necessary) Easy Sourdough Stuffing recipe.It’s a classic Thanksgiving side dish! Instant Pot Mashed Potatoes is another good one! If you make this Sweet Potato Casserole recipe, or any Happy Healthy Mama recipe, I would LOVE to see it! Please take a pic and share it on Instagram or the Happy Healthy Mama Facebook page and tag me @happyhealthymama ? That looks so amazing. The pecans just COMPLETE THE piece! Sweet potato recipes everywhere! I’ll let you in on a little secret. I love sweet potato more than pumpkin. Call me crazy haha This looks delicious Maryea. Oh em gee, did you take leaves from your yard to do this shoot? LOVE it! And, yes, sweet potato casseroles are awesome, they can TOTALLY be delicious without sugar, and, marshamallows on sp casseroles are an abomination. Just wanted to tell you that I made this for Thanksgiving and it was a huge hit! Thank you so much! I’m so glad that I found this recipe. I’m going to make these for Thanksgiving in a few weeks! Sounds amazing and great for gluten free and also dairy free! Thanks for sharing your MIL’s recipe.. I haven’t! But I do have a feeling it would work. Looks so good! Do you use real coconut milk (from a can) or the coconut beverage (from the milk section)? And can you taste the coconut in the finished dish? Thank you! I use the milk from the can and it’s really not a strong coconut flavor at all. Hello Maryea. My name is Miica Patterson and I’m a feature reporter in Pottstown, PA. Every week, I do a “Fit Friday” page for several newspapers in the Philadelphia Area. I’m currently working on a story about vegan side dishes for the Christmas holiday meal. Would I be able to use the Sweet Potato Casserole recipe along with a photo for that page? I would give you credit for both and have a link back to “Happy Healthy Mama” for all the online versions of the story. My deadline is 3 p.m. on Dec. 21. For more about me, visit my bio page at http://www.pottsmerc.com/staff/637. Thank you for the consideration. Hi Miica! Yes, you may use my recipe and photo for your article as long as you give appropriate credit and link back to my site online. Thank you! 🙂 Please feel free to email me at thehappyhealthymama @ gmail . com if you need any more information. This does look so good, can’t wait to try. I love sweet potatoes and pumpkin. By any chance, would almond milk work okay ? My husband isn’t fond of anything coconut. Thank you. Yes, I do think almond milk would work well, it just won’t be as rich since almond milk doesn’t have the fat content coconut milk does. 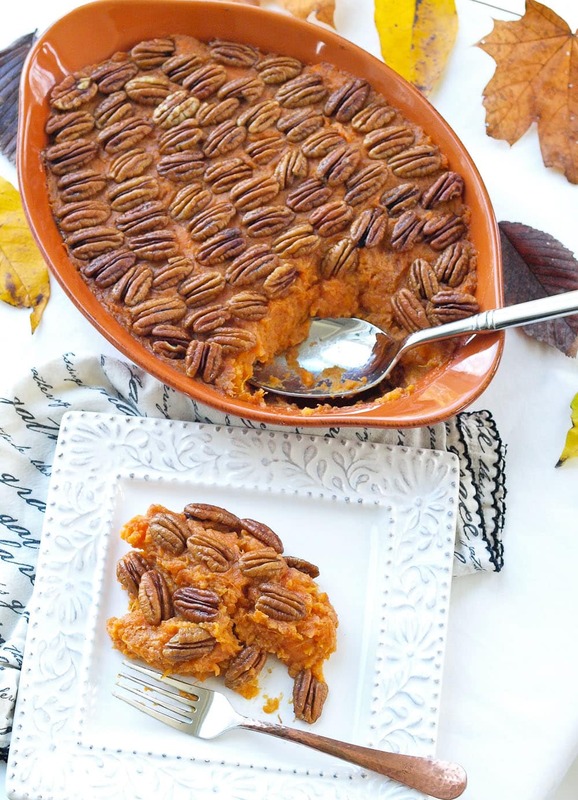 Made this for Thanksgiving instead of our traditional Sweet Potato Suffle (packed with butter and sugar) that I’d make every year before becoming Vegan….this sweet potato casserole did not disappoint! SO Yummy! My girls helped prepare it and they were so proud that it came out so delicious. Definitely making this our new traditional holiday dish! Thanks for such a great recipe! Cheers! I made this for thanksgiving and it was SO GOOD!!! Making it again for Christmas, but trying to space out all the cooking. Do you think this could be prepped the day before then kept refrigerated and heated in the oven the next day? Yes, you can definitely make this a day ahead. 🙂 Thanks for coming back to rate the recipe–I really appreciate it! 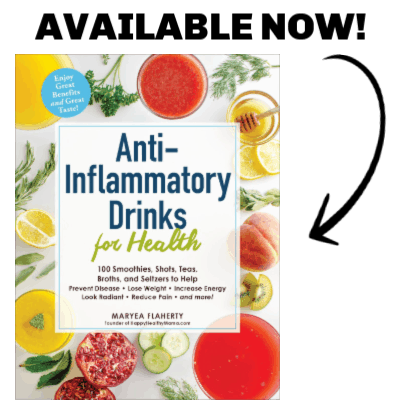 I love this recipe…and can personally recommend it! Would it be alright for me to link to it from my blog? I’m still under construction at Defining Third Age, but it is a site about living a happy healthy retirement. I’m compiling my favorite wfpb recipes for the holidays and this is definitely one of them! Can’t wait to share. Yes of course you can link from your blog, Nancy. I appreciate that. Thank you! Can you make it without the orange juice and zest? Will it still be flavorful? I’m on a cleanse and can’t have oranges…. I am making this for Thanksgiving this year.I just have a question, When you say “coconut milk”, do you mean the kind in a can or in a carton? ?